Nearly every day, we talk with people who spend hours a day sitting at their desks. We see the plagues of desk-bound days: the neck pain, tight shoulders, aching backs and even headaches. Our approach is that movement can be medicine. We identify common, predictable biomechanical motor patterns that can put people at risk for certain types of pain – even when it looks like people are just harmlessly sitting still. I prescribe patients exercises to help them maintain joint centration and reduce muscle overactivity, or tightness. 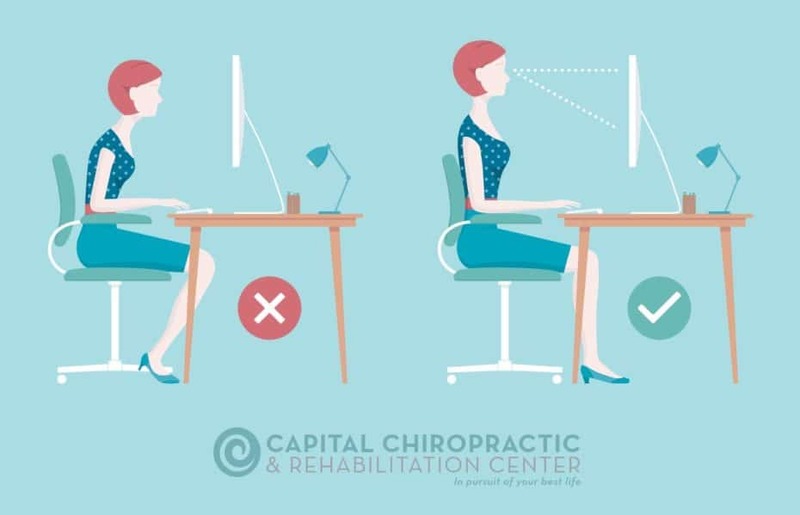 Often, these exercises relate to posture and can be done easily at work and can help alleviate neck pain, back pain, and headaches. And in fact, these exercises and tips may be essential for anybody sitting at a desk for so many hours a day. It may be surprising how much relief these simple exercises can bring to your everyday life, whether you are studying, working at a desk, or in a meeting. Think about a string lifting your head to the sky. Spinal elongation is very important for relieving muscle tension and preventing pain. Breathe into your belly. Diaphragmatic breathing helps to stabilize your spine and hold you upright. Raise your monitor. You know those old textbooks you have lying around? Put them to work! Place a few books under your monitor to raise it to eye-level. Curious about an ergonomic assessment of your workspace? Learn more about how to optimize the built environment where you work to reduce work-related stress, fatigue and pain. Rates available for corporations, non-profits, and small businesses. Contact Abbie Sawyer at abbie@capitalchirodsm.com with questions. Bring current wellness tips into the workplace with a wellness talk during the workday. Learn more about some of the topics Capital Chiropractic offers.